Caffé bene serves coffee made from the world’s best seasonally harvested fresh coffee beans to ensure you enjoy a truly exceptional cup of coffee. To complement our extraordinary coffee we offer authentic Belgian waffles, Italian gelato and natural fruit smoothies. 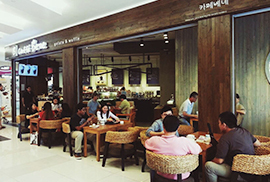 Experience the harmony and comfort of Caffé bene coffee shops where you will feel free to relax, work, or share a moment with good friends. To become Asia’s most popular café that provides the highest quality coffee and healthy food products with the best lifestyle ambience experience that will be remembered by everyone. To be consistently developing a different lifestyle concept ambience in each of our café outlet and providing its’ uniqueness. To cultivate team spirit within our organization and encourage individual development and growth through training. To uphold excellent customer service and understanding each customer’s preference and providing them the very best. We serve Liege waffle freshly made with varieties. Improved taste of traditional Italian ice-cream, gelato. Coffee shop with european ambiance. Please visit Caffeebene Outlets for more detail.